I took the Metro this morning from Clarendon in to Gallery Place this morning, and the Singing Korean Guy got on my train at Foggy Bottom, sang one verse of O Come All Ye Faithful, and got off at Farragut West. It’s not Christmas until I see this guy on the train, as it always seems to brighten my day whenever he does it. If he’d been in my part of the car, I’d have added the bass line to his carol, as O Come All Ye Faithful is one of the ones I like the best. But he got me thinking, as I put my iPhone headset back in, and queued up Morton Lauridson’ s O Magnum Mysterium. Our beautiful underground cathedrals of concrete and iron would make for an incredible place for an impromptu concert. Get twenty voices to stand on the over-crossing of the Green/Yellow tracks at the southern end of L’Enfant and you could make some amazing sound, or maybe the Metro Sales Office side of Metro Center’s upper level. But I might be alone on this. I’ve seen singing Korean guy exactly twice and it really is a rare treat. For me his appearance always started in Rosslyn and, district bound, he got off exactly one stop later. Your interest in music suggests you might enjoy the Suspicious Cheese Lords – a local, all-male a cappella ensemble specializing in early music. Next concert is December 17, 7:30 pm at St. Paul’s Lutheran. (Yeah, I sing with the group, but thought you might like us.) Cheers! 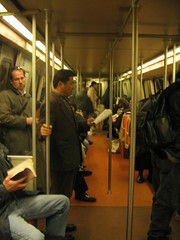 I was on the metro this morning and the poor singing Korean was verbally abused by a really angry guy. The angry guy was this jerk who was yelling at the top of his lungs that he only got 3 hours of sleep, that he was keeping him awake and that he would shove the Korean guy’s bible up his you know what. Where is the holiday spirit in that? Also, doesn’t yelling at the top of your lungs in anger bode worse than someone just singing a nice little carol?